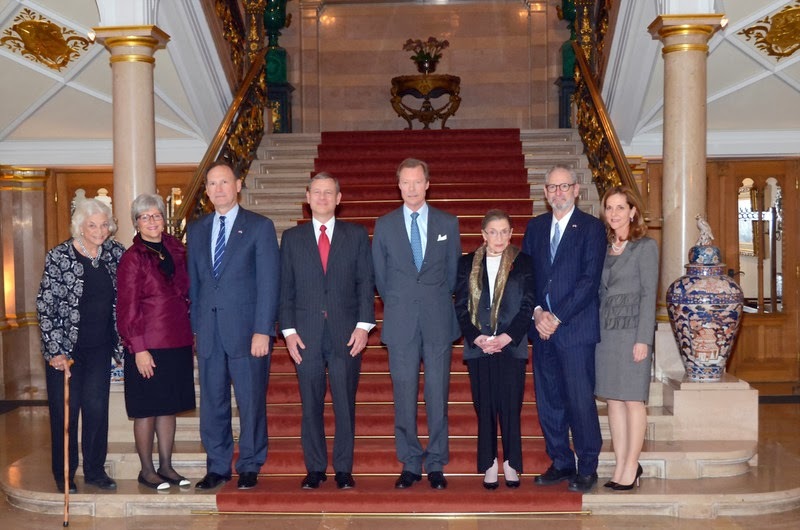 Grand Duke Henri (and presumably Prince Félix) have already left Sochi and the Olympic Games behind them as the Grand Duke was back in his usual realm yesterday to welcome a delegation of the Supreme Court of the United States (SCOTUS) in Luxembourg. The delegation takes part in an event organised by the European court of justice this week. Before leaving Russia, Grand Duke Henri took in a bit of short track speed skating and cross country skiing. Meanwhile, Princess Nora is still in Russia where she handed out the joint gold medal in the alpine skiing women's downhill competition to Tina Maze of Slovenia and Dominique Gisin of Switzerland. Liechtenstein's very own medal hope Tina Weirather was out of the competition after injuring her right tibia in training run crash last Sunday. It's not clear yet whether she will be able to compete in any of the upcoming races though it seems rather unlikely. As Weirather herself says, "it's not over until it's over" and so we will keep our fingers crossed for her. What a pleasant surprise to see some current and former members of the United States Supreme Court with the Grand Duke. To his left is it the current Chief Justice, John Roberts; to his right is current Justice Ruth Bader Ginsburg (whom I had the chance to see recently in person), and at the far left of the photograph is former Justice (and the first woman to be appointed to SCOTUS), Sandra Day O'Connor.